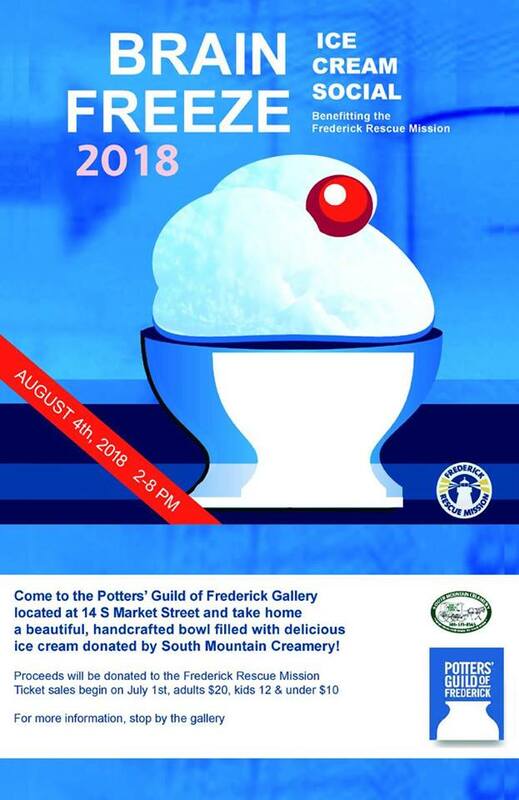 On August 4, 2018, from 2 to 8 pm, the Potters Guild of Frederick will partner with South Mountain Creamery for the seventh year in a row to raise money for the Frederick Rescue Mission. This annual event, called Brain Freeze, is an ice cream social held in Frederick on 14 S. Market Street in front of the Potters Guild Gallery. A ticket entitles a participant to choose from a selection of beautiful hand-made bowls donated by Guild members to be filled with home-made ice cream donated by the South Mountain Creamery. While eating their ice cream, participants can relax in the shade of the tent in front of the Gallery and enjoy live entertainment. Tickets are $20 for adults and $10 for children (12 and under) and are available at the Gallery from July 1 to the day of the event. The Fredrick Rescue Mission serves the poor and homeless of Frederick County by offering a multitude of services: daily meals, food distribution, recovery programs helping men reclaim their lives from homelessness and/or addiction, shelter for single women and children, clothing distribution, and outreach programs. The Frederick Rescue Mission depends upon community support to enable it to continue its good work. Staff and volunteers from the mission actively participate in Brain Freeze by helping to promote it and by providing supplies and assistance on the day of the event. South Mountain Creamery is Maryland’s first on-site dairy processing plant that home delivers farm-fresh products straight to customers’ front doors. Located in Middletown, MD, SMC is the DC area’s premier farm. Here, cows are raised from birth, non-GMO crops and feed are grown and harvested, and all the dairy, meat and eggs are processed to guarantee freshness and nutritional value. SMC’s generosity over the years in donating its fantastic ice cream has made it possible for Brain Freeze and its coordinators to continue supporting the work of the Rescue Mission. 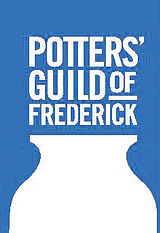 The Potters’ Guild of Frederick (PGF) is a non-profit provider of ceramic education, artistic cooperation, and congenial clay camaraderie to the community of Frederick. PGF is open to all interested individuals in the community. Members have the option of participating in PGF’s Shop and Gallery to share and sell finished work with local residents and visitors to Frederick. Available at the Gallery are unique, handmade, and locally produced options for home décor, special gifts and unique items for the kitchen. PGF provides not only clay education, but small business and craft fair expertise to the membership. Monthly meetings are typically held at the Common Market and are open to the public. The PGF Gallery is located on 14 S. Market Street in Historic Downtown Frederick and is open Wednesday through Sunday. For more information, visit http://www.pottersguildoffrederick.com .